Two Stanley Cups in three seasons is powerful statement about a team’s abilities. When those three seasons are the only three with a certain coach, it says even more about that coach. Darryl Sutter is that coach, and his most recent body of work, the Los Angeles Kings are widely considered among the top three teams in the NHL. 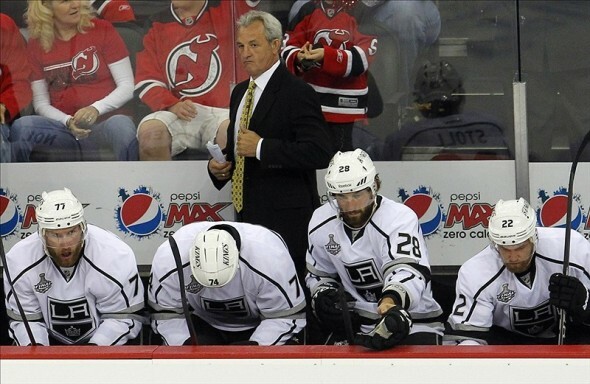 In this and future articles for the NHL Coach Tracker, we discuss the men behind the benches. Who is on the hot seat? Which assistants might be taking over soon? How exactly do coaches create winning groups? The Sutter family is one of the iconic families in the NHL. 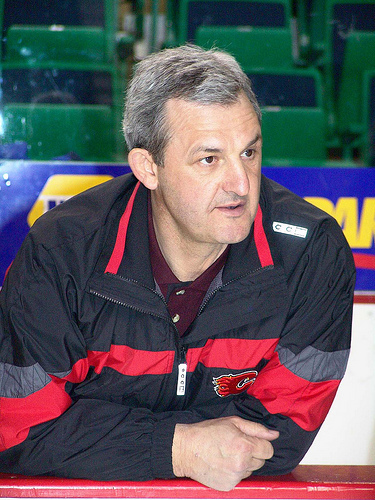 One of seven sons of Louis John Sutter from Alberta, Canada, Darryl Sutter is the current coach of the reigning champion Los Angeles Kings. He has continued the Sutter line of hockey players with his son, Brett. Six of the first generation Sutter boys played in the NHL. Gary, the only one to not make the big league, is rumored to have been the most talented Sutter brother. But he turned down a tryout to work the family farm. Brent was the most successful in the NHL playing over 1100 games and scoring over 800 points. He won two Stanley Cups with the Islanders. Darryl Sutter was the lowest drafted among the first generation and his career was cut short by injuries. But, that didn’t deter him. While he did play, Sutter was known as a very hard worker and a smart player. Darryl was limited to about 400 games and 280 points. However, he was a monster in his minor league days. Two of his seasons in the AJHL were 100+ point seasons. However, Sutter did his real damage while wearing a suit behind the guys in sweaters. With quick success in the junior circuit, Darryl Sutter went back to the team he played for. In 1992, he took over for the Chicago Blackhawks a year after they were swept out of the Stanley Cup Finals by Mario Lemieux’s Penguins. Chicago earned 106 points and won the Norris Division. However, division rival St. Louis swept Sutter’s Hawks out in the first round. This would soon become a trend for the surly-faced coach. While his teams consistently succeeded in the regular season, Darryl Sutter simply could not get the monkey off his back in the postseason. Two more strong regular seasons with Chicago led to another first round exit in ’94 and a shellacking by the historic Scotty Bowman Red Wings in the Conference Finals a year later. After a few years away from the game, Darryl Sutter returned and coached the San Jose Sharks in 1997. Patrick Marleau earned regular ice time with Darryl Sutter and the team found itself on the big stage once again. A team that had given up over 350 goals in 1994-95 dropped down to a respectable 216 in Sutter’s first year. In 2001-02, the Sharks won their first ever division championship. They won 99 points, a franchise record, but were defeated by Peter Forsberg’s Avalanche. After a terrible follow-up year, however, San Jose and Sutter moved on. Despite having Teemu Selanne and Patrick Marleau, the Sharks offense struggled especially their power play. And the goaltending just was not there either. 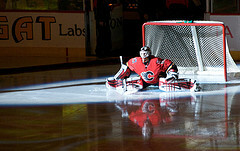 Combined, the netminders barely scraped above a .900 save percentage. Before he could even frown at the failure in San Jose, Calgary brought him on to save a dying team. Six seasons of futility and failing to make the playoffs were enough. While it took a season, Sutter got the Flames on track his second year. Their first season back in postseason proved exciting as they fell one victory short of the Stanley Cup. Sutter’s defense first philosophy dropped Calgary’s goals against under 200 (176) for the first time ever in a full-length season. Those same Flames won their first division title in over a decade his final year north of the border. Of course, we all now know Darryl as the grumpy guy behind the black sweaters in Los Angeles. The “greatest hockey city in the world” had previously wasted years of Wayne Gretzky and been bankrupt for a good amount of time. But pieces began coming together in 2009. A young squad was slowly emerging as contenders. But the offense was stagnant and every young kid on that team was prone to bone-headed mistakes. In December of 2011, the Kings hired Darryl Sutter to right a mediocre season. What a job he did. He inherited a team of egos that was barely above 500 and facing a tough Western Conference gauntlet. A phenomenal March vaulted the Kings into the final playoff spot and facing the Canucks. History remembers that team as the 8 seed that went up 3-0 in every one of its series. Jonathan Quick stood on his head and his offense scored just enough to win. Their 196 goals for was the only team in the playoffs under 200 on the season. Sutter launched his team into immediate elite status as well as to its first ever Stanley Cup. An epic battle with the Blackhawks two years in a row has shown the top two teams in today’s NHL. In 2014, many considered the Western Conference Final to be more deserving of being called the Stanley Cup Final (no offense to the Rangers). Two titles in three years, and many are talking about a dynasty. While the Kings were a team headed in the right direction, they lacked leadership. They lacked the voice they needed to answer to. As young as the Kings roster is, Sutter can be seen as a father figure to many of them. But what exactly makes Sutter the right guy for the job? 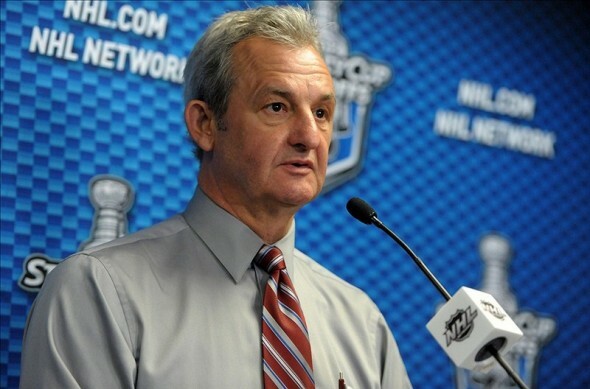 At 56 years old, Darryl Sutter is one of the older coaches in today’s NHL. As such, he is seen as a fatherly figure to many of his players. Veterans and rookies alike seek his advice and approval much like they would with family. Contrary to the face he puts on for the media and the TV cameras during the game, Sutter is actually a very happy man. He is sarcastic and personable with his players. But his determination shines through that frown behind the bench. In the bright lights of Los Angeles, it is easy to lose focus. As told by Willie Mitchell, “You see the intensity in him, the passion, it rubs off on everybody.” And Sutter’s connection with his players brings accountability to the team. Each player knows that Sutter is watching them like a hawk. And no single guy is immune to his glare. Case in point, Jonathan Quick being left to take the beating from San Jose in last year’s Game 2 of the first round. Sutter’s main motivation for this type of coaching is to make sure that no player is bigger than his team. Even with two Stanley Cups, it is hard to argue that any single player on the squad is the biggest star. Their team steps up, not just one guy. Sutter expects guys like Gaborik and Kopitar to score and guys like Clifford and Doughty to frustrate opponents. As the team buys into that strategy, it gels, and when it gels, it becomes dominant. The biggest adjustment came on the offensive side of the puck. A team that couldn’t buy a goal still struggled to score after Darryl Sutter took over. He realized that his defense first and possession mentality wasn’t going to push things along quick enough. Thus, the Kings deadly forecheck was born. Evident in their first Stanley Cup run, the Kings forecheck took teams off balance. Not only could opponents not beat Jonathan Quick, they were hard-pressed to even get into his zone! A true player’s coach (Lee Gunderson/Flickr). The Kings’ head coach may boast the most recognizable face behind a bench in the NHL, but it is just that: a face. Sutter is not nearly as much of a grump as his frown indicates. And the real persona is exactly what gets his players to work for him. He is unapologetic and unafraid to let you know if you’re not pulling your weight. Dustin Brown recalls “if you’re playing like crap, he’ll tell you. And if you’re playing great, he’ll give you a pat on the back.” But at the same time, he is caring and jovial. His son Chris, is his pride and joy, with the Stanley Cups a distant second.